Are You Looking For A Funeral Home In Conway, Arkansas? Whether you are looking for affordable Funeral Services or Cremation Services, Vilonia Funeral Home is your local funeral home located near Conway, Arkansas and can also service and cater to the families in the surrounding communities such as Vilonia and Greenbrier, Arkansas. While there may be other reputable local Funeral Homes in Conway AR serving families, our family of professionals at Vilonia Funeral Home are available to provide dignified service at an affordable price. Vilonia Funeral Home is a family owned and operated funeral home which means that we provide personalized funeral and cremation services at affordable prices. Let the experienced funeral and cremation experts at Vilonia Funeral Home serve your family. For more information, contact Vilonia Funeral Home at 501-796-2275. Whether you need help planning a funeral, cremation, selecting a monument, or casket, Vilonia Funeral Home can help. We provide a full spectrum of funeral services In Conway, AR. 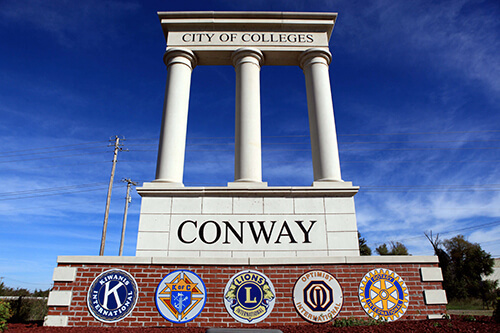 Do you charge extra to have a funeral service in Conway? No! Our prices are the same within 50 miles of our funeral home office. If we travel outside of 50 miles than there is an additional mileage charge only. How do we get a death certificate in Conway? We will process the original death certificate through the Faulkner County Health Department in Conway. There will be nothing you have to do except provide the required information during the funeral arrangements. Can we have our visitation at a church in Conway? Yes! We will work with you and your church to have a visitation during the day or in the evening at no additional charge. If death occurs in another town, can we still have the service in Conway? Yes! Just call us. We will make all the necessary arrangements to bring your loved on into our care, and prepare for the ceremony in Conway. How do we get the grave opened at our cemetery in Conway? We work with a grave digger that opens/closes graves at all the cemeteries in Conway. We will make sure everything is handled as you wish.